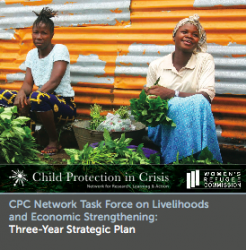 This document gives an overview of CPC Learning network, including our Theory of Change, which illustrates and clarifies the specific contributions that the CPC Learning Network makes to the lives of children, families, and the child protection community worldwide. 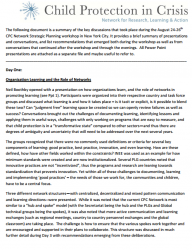 The following document is a summary of a three day strategic planning workshop that took place during August 2011 in New York City. It provides a brief summary of presentations and recommendations that emerged both during the workshop. 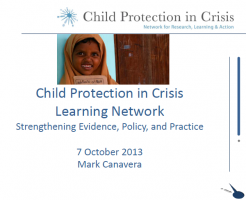 This 2013 presentation introduces the CPC Learning Network mission, current global objectives, task forces, and partner learning groups. 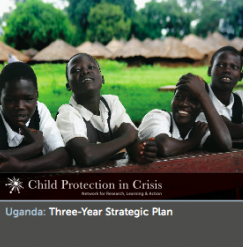 This is the three-year strategic plan for the Child Protection in Crisis Learning Network in Uganda. 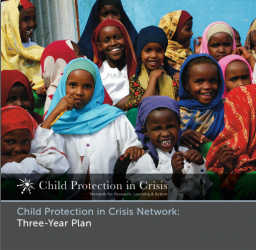 This is the three-year strategic plan for the Child Protection in Crisis Learning Network in Indonesia. 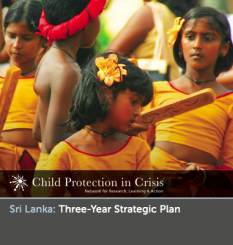 In consultation with its members, the CPC Secretariat established three overarching priorities to be pursued from 2012 to 2015: systems mapping to address the range of interrelated factors that contribute to violations of children’s rights in relation to the larger context of immediate and underlying causes, engaging universities and professionalizing the field of child protection, and improving and disseminating measurement and evaluation tools. 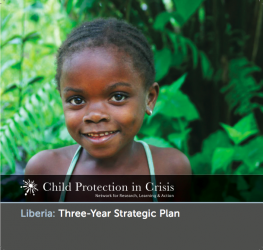 This is the three-year strategic plan for the Livelihoods and Economic Strengthening Task Force of the Child Protection in Crisis Learning Network.